Rectangular Connectors, a system of housings, inserts and contacts that come together to offer robust, secure and easy to assemble solution. 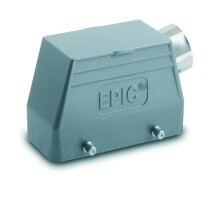 A range of inserts suitable for all the EPIC® rectangular connector housings, available from 3 pin contacts up to 64 dependant on your voltage and current requirements. A range of modular inserts that allow the combination of data, power, hydrolic and fibre connectors all in one housing, giving the flexibility for specific applications. These ranges of rectangular connector housings are available as a hood, panel base housing, surface base housing and cable coupler hood. The housings are manufactured from different materials such as: Thermoplastic, metal die-cast, powder coated. Click here to see our full range of rectangular connectors.